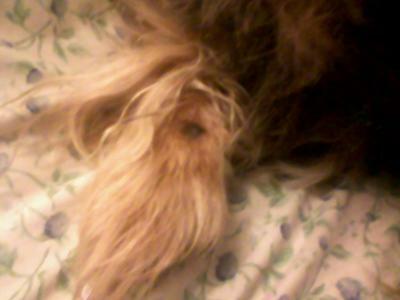 My 12-year old half Yorkie, half Silky Terrier has a small black spot on his front paw just near the duclaw (sp?). It looks like a little cigarette burn. It is flat and the hair is gone from that small area where it is black. It is about a quarter of an inch in diameter with regular borders and basically symmetrical. Over the past two weeks it has doubled in size. My dog has never been one to let me inspect a potential medical issue on his body and this one is no exception. Whenever I so much as look at it, he curls up his lip at me. In the few seconds that I am able to sneak a peak at his paw, I have noticed that the duclaw next to the spot is not black nor as thick as all his other nails (including his duclaw on the other paw). He is constantly licking it. including it just in case. About 6 months ago he had a small raised dog skin bump on his back that appeared more suspicious than a flea bite. The veterinarian said it was probably a benign mass and would disappear in about 3 weeks, which it did. One final note, he often appears very uncomfortable. It is hard to explain, but he moves around a lot, moaning as he does so. His back also seems to be itching more than normal and every morning he spends about 10 to 15 minutes rubbing it on the bottom of a door that is just his height. I am concerned that the spot on your dog’s leg had doubled in size in just two weeks. This can be a sign that something pretty serious is going on. My biggest worry in this case would be cancer. Of course, it could be something else entirely, but I would definitely get it checked out. Your vet could also take a look at your dog’s skin and see why he is so itchy and uncomfortable. In the meantime it wouldn’t hurt to check him for fleas if he’ll let you or to simply apply a good flea control product like Frontline and perhaps try an herbal supplement for itching too (such as Allergy Itch Ease)>. Don’t ignore the spot on his leg, however. I doubt either of these two suggestions will make that go away.